The Vaugh Institute of Agricultural Engineering and Technology (VIAET) is committed to academic excellence in undergraduate and postgraduate's education and research programmes across a broad spectrum of disciplines in agricultural engineering. Agricultural Engineering began from here in the year 1942 and became the pioneering instituton to offer agricultural engineering degree in entire Asia; and fourth in the world. The study programme emphasizes basic knowledge as well as its application. All the programmes offered at the school covers the fundamentals and current frontiers of technology to meet the educational objectives and prepare students for future challenges . The Institute has a broad spectrum of disciplines such as soil and water engineering, farm machinery and power engineering, food process engineering, renewable energy,. 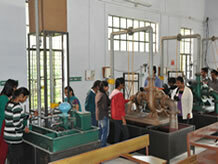 The Institute has a flexible approach towards the various M.Tech. and Ph.D. Programmes that it offers. The specializations offered in M.Tech. and Ph.D. programmes attempt to accommodate an individual's interest and need. In addition to eight conventional fields of study, a student enrolled in any academic programme, at the advice of his / her academic advisor, can select a combination of courses from the eight fields of study as well as some courses from other schools also. This entirely depends upon the student's research interest. The knowledge and skills acquired help students to play positive academic and professional roles in solving natural resource management problems. The school's three-fold mission of teaching, research and extension ensures social, cultural and economic benefits to India and beyond. Overall, the Institute is a regionally prominent and internationally reputed institution offering unmatched comprehensiveness, diversity and quality. Excellence, innovativeness, interdisciplinary approach and responsiveness remain the core values of the Institute. Eligibilty: B.Sc. Comp. Sc. / IT or BCA with Maths at 10+2 level or B.Tech Comp. Sc. and Engg. / IT or related field.